The only consistently good thing about the NFL training camp news cycle are stories about players who may or may not be fat. I wake up every morning in May and June thirsting for grainy or oddly angled photos of football players so that I may spend hours scrutinizing them in an attempt to reach a verdict of Fat or Not Fat. So, I’m really enjoying this Kelvin Benjamin saga. And now, to complete the cycle, we’ve got comment from Rivera, who doesn’t think it was fair for everyone to be hassling Benjamin over one picture and one video clip so many weeks away from the start of the season. According to the Charlotte Observer, Rivera said that the whole issue has been “blown out of proportion” after practice yesterday. Hey, Ron, you know what else is blown out of proportion? 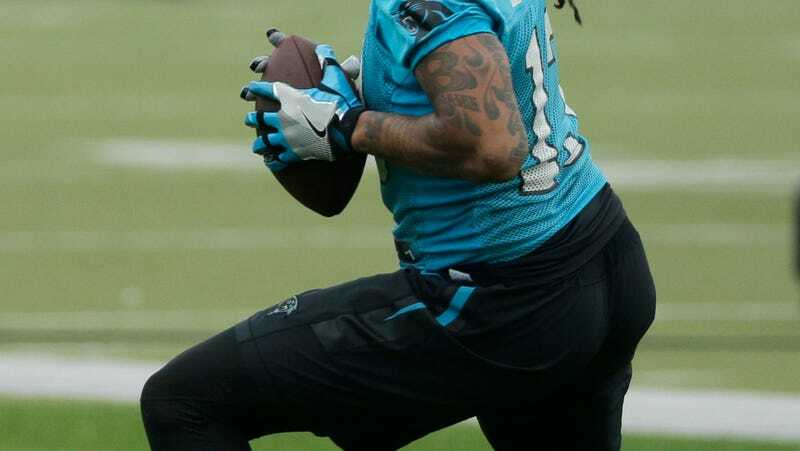 Kelvin Benjamin’s love handles!!!!!!!!!!!!!!!!!! Rivera is obviously correct and this will be a non-issue once Benjamin works himself into shape, and he has plenty of time to do that. But do you really expect me to spend the summer months caring about the fact that Josh McCown is capable of throwing a football? I’m here for the fat drama and I won’t apologize for it.